MyCRM Blog | Does my Small to Medium sized business really need a CRM and if so, what is it? ← Is a good dose of CRM the answer to GDPR regulation and data requests in your business? Working in the software industry it is never easy to explain what you do, unless you are explaining it to another colleague or likeminded individuals. It really is one of those industries that if you work in the sector you understand it, but the world would happily keep on spinning and people would keep living without needing to know how software really works. So this post is going to focus on the need for software, especially business software and why smaller organisations can benefit from a smart straight-forward approach. We have all been there right? With post it notes and excel sheets recording data and a collection of Word or PDF documents with nothing connected. If your business is just a few people, with the business owner leading the day to day activity, you can usually get by because all the information is available between the few people that are working in the business. However, there is a limit and this usually starts around 5 employees, less if you have people job sharing a role. The problem that all businesses face and it does not matter what size the business is, they all need to have quick access to data that is held about their customers. Secondly, data must be shared across the organisation so that it is current and up to date and there is an audit or record of who did what and when, and who said what. A lot of businesses do not really understand why they should have CRM, however in reality they understand that they need a database and at the end of the day a CRM system is an advanced set of functions, processes and actions on a database structure. Starting from May 2018 (and I do cover this in a different blog), the implementation of GDPR (General Data Protection Regulation) compliance begins and it is really important that businesses of all sizes focus on data access, availability of data and security of the same data. So the best way to do this would be to put all the data into a single centralised place so that everyone can access it, sounds easy right? Well to be honest it is pretty straight forward, if you ask a service provider to do it the costs may vary depending on amount of data and complexity. Here at MyCRM we are always happy to advise and discuss options that best suit your business. Then let us know if your CRM strategy really measures up for your business. So let’s get down to basics and describe what a CRM system or a Customer database is and how it can help you achieve within your business. 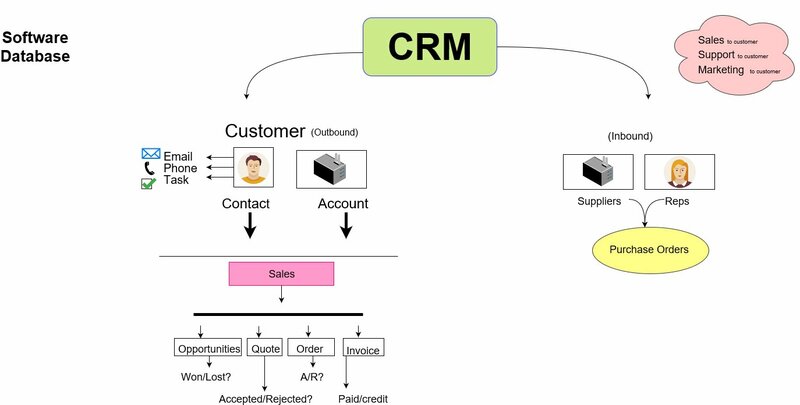 Firstly, we are going to look at some top level structures on how a CRM database is layered. You will see from the structure above that the main structure of the CRM is based around your customer and the activity that is recorded in each business area. This should come as no surprise, with the diagram identifying how a ‘Contact’ and an ‘Account’ make up the customer record. For easy definition a Customer is a person or a business that is spending money with you. A customer has interacted and paid for a service or a product. In the above diagram we have not considered prospects or leads; this will come later in this piece but the top level diagram is intended to show the two sides of data flow within your organisation. What we are looking at here is a typical debits and creditors scenario where you have invoiced sales from customers and outgoing purchases to suppliers. All business will have a need for both of these, and they are tracked separately. Your business or organisation will probably make use of a finance package, and integration is usually the preferred option as it is not recommended to try and turn a CRM database into a finance solution. Your business can however, run customer billing through a finance system or through CRM. 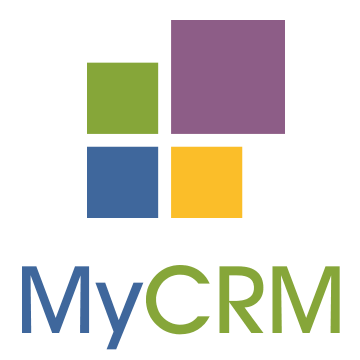 Here at MyCRM we opt to bill customers through CRM so that we have a clear picture of inbound and outbound revenue in a single place. Let’s now focus on the ‘Customer’ element of your CRM or Customer database. The structure of these are important and having an understanding of what needs to be recorded in each record is key to success. In most popular CRM or customer database solutions, the recording of customer details is usually done in two separate records. The key reason for this is that a customer can incorporate B2B sales and not just B2C sales. The ‘Account’ record in the above is defined as a business record and holds all key information about a company that you are doing business with. 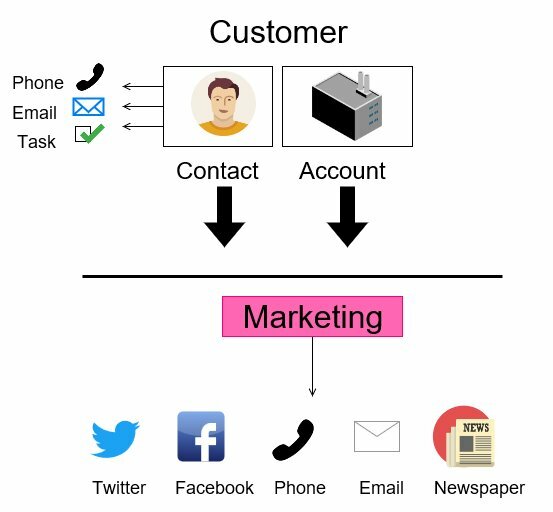 The ‘Contact’ in the above is either an individual who is or is not connected to a business. If your business predominantly sells to individuals i.e. B2C, then your individual contact will be your customer. If your business focuses on selling to other organisations i.e. B2B then your customer will be the ‘Account’ or organisation with one or more contacts within the organisation you are working with. So what is next? Well after defining how you want to record your customer details, a popular CRM solution will enable you and your colleagues to record activities and interactions with the customers you do business with. By default, the popular activities will be email, phone and task but these interactions and activities can easily be extended to record event registrations, campaign interaction or even project tasks. By recording activities, you quickly build up a history of how you and your colleagues interact with your customers. So should a customer ever request information about what you record about them it will be very easy to present a full report if all their data is centralised. But CRM does not stop at contact management, the full concept moves forward as per the diagram above and all good systems will be able to record and document data around given business activities. Sales:- Your organisation will have a sales process either fully detailed or just ad hoc, but a CRM system will enable you to record these sales engagements with your customers. A sales process will lead your sales team from the initial opportunity through the quote to order process and on to billing and invoicing. We know from experience that each organisation will have its own way of doing things and your organisation will probably be no different. A CRM system can offer flexibility and allow you to configure the process for your organisation allowing internal requirements to be met. A basic sales process is made up of 4 key items, but additional activities can be added depending on the product or service being sold. If implementation of goods and services is required or a component has to be sourced or a bespoke build is required, then you may as part of your process detail an implementation plan or show how a project is managed. These steps are usually associated to the opportunity and detailed with a customer before a quote is raised. Other inclusions could exist as part of the sales process like milestone or stage billing. If the product or service that is being sold is a subscription, then monthly billing may also be a consideration and your sales process will need to include these options. Below we take a look at and outline the high level CRM sales process records. What is the Opportunity – Usually the opportunity is seen as a given level of interest from an existing or potential customer. The opportunity record starts the sales process by detailing the value of product and services that may make up a sale. As the opportunity is not an order it usually has a given and estimated potential value to your organisation. What is the Quote – A quotation is used to detail and configure the value of products and services to a given customer. A quote is prepared and sent to the customer for review. A quote may have several iterations as discussions take place and a CRM system will enable you to review or add many different quotes against one opportunity to outline potential options. What is the Order – The order will be based on a verbally agreed or in some cases an approved quotation. The order is usually the final detail along with specification of what items make up the sale and how payment for the goods or service will be made and any terms and conditions that may apply. An order may require as part of your process, to include a signature, this may be a signed print out or an electronic signing process. What is the Invoice – As mentioned above it is very likely that your organisation will have implemented a finance system like “Sage One” or “Quick Books” as an example, but a CRM system will include a billing component and this can be really useful if you have a need to report on which customers spend the most with you. Having a financial information available on accounts also enable the rest of your colleagues to get a full status of a customer and see if invoices have or have not been paid. One of the advantages of having your sales process refined and detailed within your CRM system is that you can easily produce a revenue forecast and sales pipeline that is currently activated in your business, meaning you can predict cash flow and profit over one or more months. Marketing:- To be honest I could go on and on about this topic and explain why it is probably the most important element in your business. At MyCRM we have had the opportunity to work with many many customers both large and small and have always advocated great marketing and a great marketing strategy. Some of our customers we see activate marketing as an expense, but the real opportunity comes when marketing is linked in with a defined marketing process that can be actively tracked. Marketing is about content, but in reality your marketing process enables you to track what works and what does not. You would only allocate a marketing budget for your business once you have defined a strategy and a process for recording the output. I have seen business owners spend a lot of money on data, on 3rd party email sending services even on social media campaigns and then sit back and expect all the business opportunity to come flowing in. In reality if these activities are not tracked as part of your central customer or CRM system, then it is likely that the marketing will run in isolation and no real benefit will come, because there is no real interaction with the ongoing activity. The key to marketing success and my favourite phrase is “Test and Measure” any marketing either online or offline through your CRM system will enable you to track what is working. A CRM system can be easily extended to send bulk email messages, and be easily connected into things like Facebook to help you track marketing activity. Once you start recording how prospects and existing customers respond to your marketing and content, you can start to measure and work out the exact cost of sale for each sales opportunity generated. If you are finding that the cost per opportunity is greater than the value of your potential sale then you need to revisit how you target, but never ever cut your marketing budget thinking it does not work. In my forthcoming book “The CRM Blogger” a number of topics around how to market your business services and track activity in CRM are covered from hard copy to digital and social media. A CRM system will help you centralise for marketing activity and help you record business and sales opportunity, which your sales team can then action. Hard Copy – Once thought to be dead and a waste of paper, hard copy marketing is once again on the increase. The general reason for this is, as people and individuals we like to touch and hold things and not always read content online. The e-Reader and e-Book was going to be the revolution and would have meant that book sales would decline, but the opposite is happening and book sales once again have started to increase. Using hard copy advertising is seeing a resurgence for exactly the same reason and this type of medium can include Magazine, Leaflet, Letter, Brochure, just to mention a few. Your organisation could also get creative and have branded merchandise for a given campaign. Soft Copy Email – Still a very popular medium and billions of emails get sent daily around the globe. Email marketing in bulk or as individual contact emails is a very powerful solution as long as the recipient is aware of your brand. If you want to grow brand awareness, then running campaigns with main stream providers and having a sponsored slot or inclusion can help grow traffic and response rates along with awareness. Soft Copy Social – A rising star in the business community and a whole new medium, we have all seen as marketers, the growth of social media and presence. Some might include social media under advertising, but as the growth of the medium increases daily we tend to see this as a separate marketing channel. Social media can include adverts / posts / tweets and the management of groups and again this is covered in different posts. Facebook and twitter currently seem to be the backbone of social engagement for most businesses and both provide interfaces that can be included within your CRM to track activity. Advertising – This sector for me means TV, Radio and Billboard promotions and many smaller business cannot afford to go down this route. Most see this as a medium that is too expensive or two much of an investment to make, but with the increase of the number of radio and TV channels along with sporting events and festivals, it is worth consideration as prices for campaigns have now lowered as competition for advertisers has increased. Case Management – A good CRM system will include case management and support contract roles and most of the popular systems in the market place will have this functionality included out of the box. Cases are usually raised as an incident or issue tracker to resolve a given request from a customer. 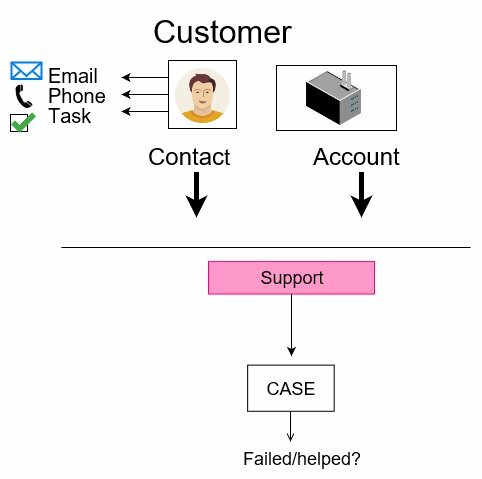 Case records can be tracked and assigned to individuals in a support team to enable quick resolution based on topic or customer. Account Management – Having a detailed account management strategy and process within your organisation will enable you to manage your customer base and offer new services or interact with a customer when help is required. Account review should take place monthly but again this depends on the product being sold. CRM will enable you to track this activity and by having an inbuilt process to keep that actions of engagement current, your customers will benefit from long term engagement. Account management can provide interaction about customer interests, what type of marketing they would like to receive and for your organisation to understand the main points that a customer has. Activities or even Cases could be raised to track these engagements, along with telephone or online customer survey responses. Education and Training – Depending on the service or goods that your organisation sells, it is important to track the success of the product engagement with the customer. Using online training videos, or KB articles can enable a customer to ask questions and get related answers. If you are providing software solutions or online subscription services, offering a training and education portal can be a great way to enhance customer engagement and satisfaction. Again all this activity can be tracked through your CRM system, enabling you to report and see trends of customer engagement and see which customer may need a little extra help. You might be surprised to hear but a CRM system does not just need to be about managing customer engagement. There are other aspects to your business that can also be actively tracked though a centralised database and one of those key activities would be Supplier and supplier engagement. Your business will have suppliers and in some cases you may act as a reseller, but in others you may carry a level of stock. In other instances you may have services for day to day activity, but it is worth keeping all the contact and activity data in a single system. 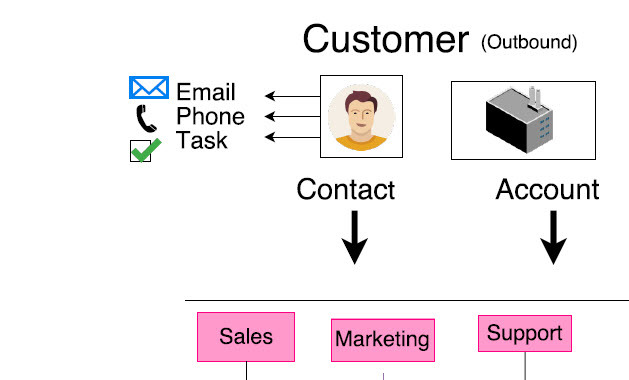 You can see from the diagram above that the structure to a company supplying your organisation is pretty much the same structure as a customer buying from you, so CRM lends itself very well to recording these interactions. Supplier – A supplier record type in your CRM could be included in the account record with a type setting of supplier or a separate record type or entity could be created to record information about companies supplying your business. Separating or including this data as part of the account really depends on how much data you want to hold and what other record types you want to record against the supplier record. Representative – Similar to a contact record which is a customer, the representative record portrays the individual from the supplying organisation and the details recorded are similar to a contact record. Again it is purely down to preference how this data is modelled in your organisation, but if different parts of your business only deal with supply then separation may be a better option. Quote Request – Unlike a customer quote, a quote request is like an RFI a request for information from a given supplier. This request can be recorded in CRM under the supplier and responses tracked either by email or phone. This record type is a shopping list or detailed specification to the supplier. 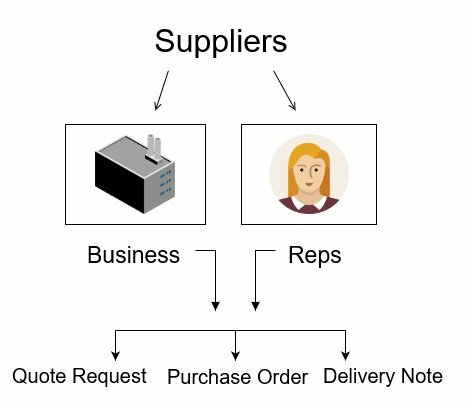 Purchase Order – A PO or purchase order can be created in CRM to record the monetary value and listed supplier products. Once you receive an invoice from your supplier you can attach it to the PO and close the record as a complete transaction. Delivery Notice – If you are expecting to receive goods that are physical, then a delivery note record can also be recorded to confirm receipt of goods. Thinking about other interaction types. In this article we have covered the two main areas of CRM activity which cover how you can interact with Customers and how you can interact with Suppliers. A good CRM system can be much more than this though and can also be used to centralise other critical areas in your organisation as it does not stop with these two main topics. Other areas that we cover in different article include Recruitment, Resource or HR management, Project Management and Asset Tracking. So as you can see a CRM system in your small to medium sized business can add a huge amount of value and enable you to manage your enterprise.